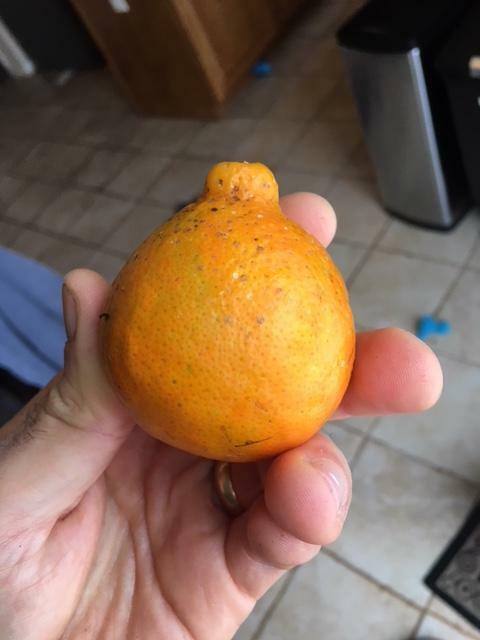 In another post somebody commented that the my variegated minneola looked like a type that would not produce the desired red-striped fruit, as the foliage is green/light-green instead of green/light-green/white. My small tree produced three fruits, and none show any red striping. I don't see any white on the new growth, either. I suspect it will always be this way so I will dig it up and replace it with the green/light-green/white one that I still have in a container. Harris sent me two because the first one arrived with heavy shipping damage the second was a replacement. The first one recovered though so I ended up with two healthy trees, one of each type. Brian, was it me? I found out that there are two types of variegated Minneola a few years ago. I guess the one with two tone leaves (green-yellow) is a sport from the three tone (white-yellow-green) one. I saw the 15 gallon trees for sale in our HD and Lowe's 3 years ago and I thought it was odd. The new grows was variegated green-yellow and the fruits looked like a regular Minneola. I was looking for one in 3 gallon for awhile and couldn't find it neither the info online. Last year one of my trees grew the sport and I saw the thread on the other forum about the Harri's trees with the pictures. So, apparently I was the only one who saw this trees in production with different looking fruits and warned people. I also saw the picture you posted. The sport limb produced the fruit and I have the different looking fruits on my tree, so I will call it a Cocktail Minneola tree. )) However, the fruit without stripes doesn't look like the one on your picture. It doesn't have the 'neck' and is bigger in size. Ah yes I think it was you that described this to me. My fruit are undersized because the tree was a bit shocked recently. I’m sure it will produce normal sized fruit in time. My experience is that all minneolas usually have a neck but it seems a bit random per fruit rather than all same from one tree. Minneolas at the supermarket are mostly necked fruit, however there are also always some minneolas that have no neck. No neck on mine this year.